“This is a local issue,” a neighbor said, asking for a response. San Francisco is in the process of finding ways to make buildings safe for birds. In fact, the Supervisors are right now in the process of figuring out what rules are needed (they’ve decided in principle that it should be done). Bird-killers. More dangerous than wind-farms, more insidious than cats… it’s windows. (The glass ones, not the thing produced by Microsoft.) Birds can’t see normal glass, and crash into it. Either they die, or they become easy prey. If you’re living in San Francisco, please write to your Supervisor to support this. And meanwhile: If you find a crashed bird and it’s not dead — try to rescue it by providing a safe quiet place and some food and water. 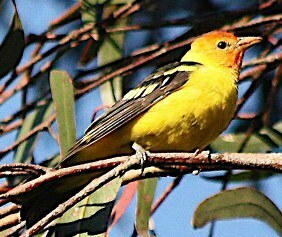 There’s a heart-warming story here on Walter Kitundu’s marvelous bird blog, wherein he saves a young Western tanager. It has some charming photographs. ← Oops. Ouch. Crash. Careful on those slopes.